On the week of August 21, 2017, I saw an eclipse and survived the worst flood in United States history. Quite a story to tell the grandkids. 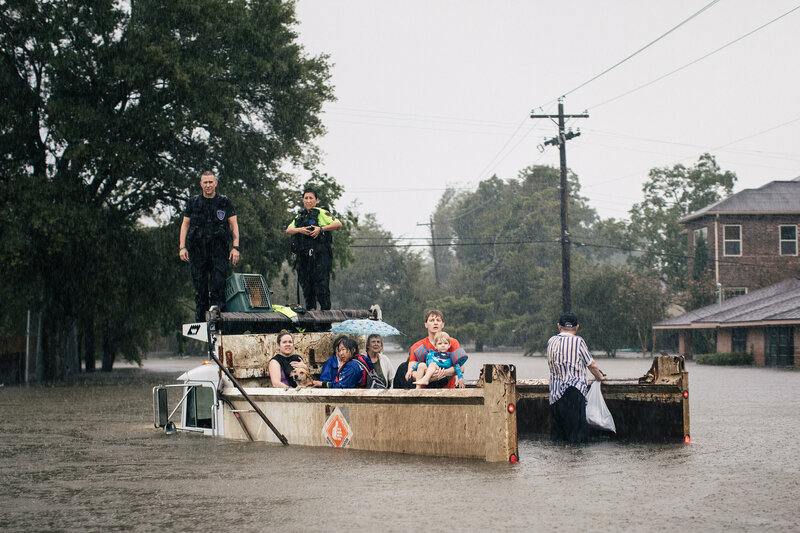 Until yesterday, I remained at my parents’ house in Pearland glued to the news, watching dozens of personal accounts on the Houston floods online from Facebook friends, witnessing people being rescued off of highways by boat and losing everything they own. Today, Houston embraced the sunshine shining down again after days of catastrophic rainfall. I’ve never seen so many Texans happily rejoice in feeling the scorching rays of the August sun. My whole city is still underwater. I’m trying to find something that will force me to recognize that yes, this is real, and it’s happening right down the street. But it still feels like a weird dream. And yet with the terror flooding social media (no pun intended), I feel a great sense of pride seeing this population be so incredibly responsive to volunteer efforts as they remain available for other Houstonians who are in more dire conditions. Shelters are turning away volunteers and donations because they are already overwhelmed with the response, and that is the most astounding, inspiring work of positivity I’ve ever seen. It makes me feel insanely proud to be from the city of Houston. Thousands of people have been displaced from their homes. They are from all areas of Houston of all ages, rich and poor, and they continuously share with the media that they feel grateful to be alive. They are populating shelters situated throughout the city, which includes the massive George R. Brown Convention Center. I note this because, for my female friends in computer science, this venue hosted the Grace Hopper Celebration for Women in Computing the past two years. In addition to George R. Brown, schools, churches, and stadiums everywhere are dedicating space for the evacuees. Many of these shelters include people from my hometown of Pearland, Friendswood, Alvin, League City, Pasadena, Dickinson, Santa Fe, Katy, Cyprus, Conroe, Seabrook, Kemah, the Westheimer area, Downtown Houston – my family household names that are taking over the news across America. The entire country is sending financial help and support for our city – my city. It’s surreal. It reminds me of when Houstonians helped Hurricane Katrina victims in 2005, and if the city of New Orleans is alive and thriving today, Houston can also recover from this flood. We have the manpower and the faith to make it happen. So if we knew this was a Category 4 storm, and Houston is already prone to flooding, why did we not evacuate? I was ten years old when Katrina struck New Orleans. My mom’s side of the family is from there, so we knew relatives and visited that city at least once a year. We grieved for the people and landmarks destroyed in that disaster. I remember Houston being a popular place for refuge for thousands of people left homeless from the storm. So when Hurricane Rita was scheduled to directly strike Houston as a Category 5 one month after Katrina, everyone panicked. My family decided to evacuate along with the entire city. My 7-year-old brother, myself, my parents, and grandparents packed everything and headed north, but we only made it to the opposite side of the city. The 30-minute drive turned into 18 hours gridlocked on the highway. When I recollect on hurricanes, I flashback to Rita and the terrifying experience of fleeing from the unknown. We were stuck on the highway with a storm as strong as Katrina heading our way, and I was unsure if our house would still be standing when we returned. Luckily, Rita shifted and did not directly strike Houston, but it would have been a different case for Harvey. The Houston area alone contains at least 7 million people – that’s greater than the population of most U.S. states. If everyone had tried to evacuate for Hurricane Harvey, there would not have been enough time for everyone to leave the city before the storm. It intensified too quickly for people to prepare. If a city-wide Harvey evacuation was anything like the evacuation crisis during Rita, with everyone trapped on the roads in their vehicles, there would have been a much greater number of casualties. Without a doubt. For natives raised on the Gulf Coast such as myself, hurricanes are not new, and we didn’t expect this one to be worse than Katrina, Rita, or the disastrous Hurricane Ike that directly hit Houston in 2008. But Hurricane Harvey was unprecedented. On Sunday night, 9 trillion gallons of water had already fallen on greater Houston and Southeast Texas. 9 trillion gallons is enough to fill 33,906 Empire State Buildings, from basement to penthouse. It would take 9 days straight for the Mississippi River to drain into Houston and equal the amount of water already there. It is enough to fill the entire Great Salt Lake in Salt Lake City – twice! If this amount of water was spread across the U.S., it would cover the ENTIRE country by the height of 3 pennies stacked on top of each other. It could fill 2.3% of the volume of the Himalaya mountain range, which includes Mount Everest. In the wake of this storm, rescued citizens on the news continue to have positive spirits. Many of them smile at reporters, grateful that they are alive and that they still have their loved ones, even though they’ve lost everything. There’s an overwhelming amount of faith radiating from these people that is truly special, even in the worst catastrophe that the Texas Gulf Coast has ever faced. Pearland received over 40 inches of rainfall and is mostly dry, which is a miracle, and I’m grateful that my parents, my grandparents, and I are amongst the lucky ones who survived this storm with electricity and more than enough food and water. The southeast portion of Texas is going to be paralyzed for a while, and thousands of people will still be in need of help for a long time. If you would like to volunteer or donate to Hurricane Harvey relief efforts, the amazing fellow NCWIT member and NASA Pathways Intern Kirsi Kuutti shared a list of ways of how to help Houston on her website. Be sure to check it out and find ways you can volunteer your time and donate to the people of Texas. The amount of love and support from the American people through this event has positively influenced me and friends who have lost much more than I have, and although it may take years to recover, we will recover. Thank you.